After sitting in the office of Chief Investment Officer Mark Amstutz, several students involved with the divestment group Mountain Justice are now facing citations for disorderly conduct. 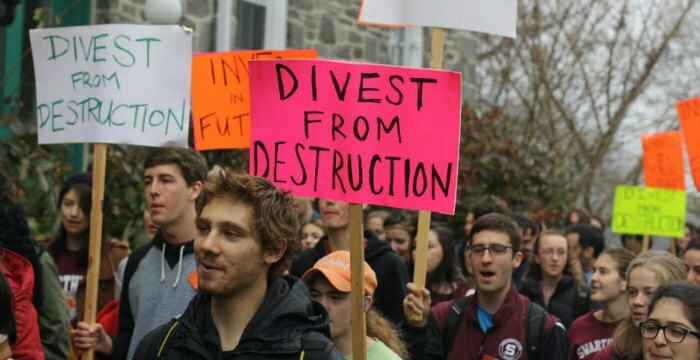 While we remain categorically opposed to divestment and in no way condone the tactics Mountain Justice has used both now and in the past, the Swarthmore Conservative Society believes that issuing citations to peaceful student protesters is harmful to campus life and that the process in which the citations were issued was arbitrary and unjust. Following the 2016 election, many college campuses descended into chaos. UC-Berkeley’s campus broke into riots after Milo Yiannopoulos was scheduled to speak at their school and violent protesters at Middlebury College assaulted a professor while trying to disrupt a talk by Charles Murray. The Conservative Society believes that while protests at Swarthmore have certainly been disruptive in the past, our school still has a tradition of civil protests. When Charles Murray came to Swarthmore, for instance, the administration, the hosts of the event, and protesters came to terms so that those who wanted to listen to Dr. Murray were able to while those who wanted to protest could do so in a coordinated and organized manner. The college certainly should issue sanctions towards disruptive actions taken by students, as in the case of the 2013 student takeover of the Board of Managers meeting when Mountain Justice members clapped down their fellow students, however, by choosing to reprimand students participating in a relatively unobtrusive protest, the college will only embolden the voices on the fringe of the student left at Swarthmore who believe that more aggressive tactics are justified. The process in which the citations were issued is also a cause for concern. As far as we can tell, students who participated in the sit-in were not treated equally. Some protesters had their ID numbers recorded by public safety and were subsequently cited, while others had their ID numbers taken and were not cited. This arbitrary application of the student handbook is inconsistent with the ideal of equal protection that we ought to expect from Swarthmore. It is also clear that Swarthmore’s official policy on dealing with students accused of infractions is often lacking in due process, as some of our own members can attest. In our discussions with Mountain Justice, we were also told that they were given an unclear warning that they might be cited while they were conducting their sit-in. As far as we can determine there is no precedent of the College actually enforcing their rule against sit-ins so any reasonable protester would not expect punishment. If the College had properly handled this situation, they would have given clear instructions to students to leave or be cited rather than make this event seem like every other sit-in of the past few years that had no disciplinary repercussions. The protesting students did violate the rules set forth by the student handbook by refusing to leave a private office upon being requested to do so. The possible punishments for this offense range from a warning to probation. We at the Swarthmore Conservative Society hope that the administration will issue only a warning this time and work to communicate with future protest groups so as to prevent the escalation of militant protest tactics that have engulfed so many other colleges. Similarly, we hope that Mountain Justice and other protest groups will commit to productive tactics going forward and abandon previous strategies that silenced their fellow students. CORRECTION 3/23: References to “academic probation” were removed as it appears that students are not being threatened with academic probation, but simply probation. As a communist, I agree. It is essential for the survival of the socialist state that freedom of speech, freedom of expression, and most importantly freedom to protest are protected. This isn’t just a conservative issue, this is an issue of civil rights. Now, I wasn’t at the protest, and I’m not sure what happened, but the administration’s version is rather lacking in details. I know that the administration often /cannot/ release some details in its statements, but the amount of details lacking and the generally vague assurances that the students cited were being disruptive sound a little fishy. I’d like the administration to offer a letter that (a) actually gets the dates and times right, and (b) includes full statements from PubSafe, plus an explanation of what real, serious impediment was caused to college operations as a direct result of the protest.